Uh...this is a road? This photo was taken at "Point A" on the map below. In fact, it's a ranch road through a field, and not a very good road at that. Ouray County Road 906 GPS track. Note "Point A." I'm standing looking south from Point A and took the shot at the top of this post. What’s happening is simple: DeLorme must’ve developed their road network from aerial photos. Sometimes it’s hard to tell the difference between a public and private road. Looking at the GPS track above, I traveled all of Ouray County Road 906. Note how many side roads the DeLorme map shows. And yet these are either driveways or roads on private land. The southern part of the north-up map is accurate—you can see that the track follows the road closely. However, after I finished riding up and back on Glenn’s Road, I turned west onto what I call the Lower Powerline Road, one of my favorite close-to-home rides. 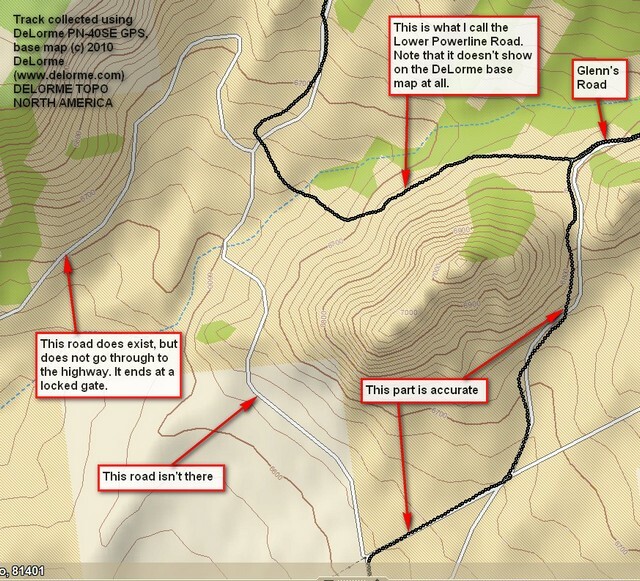 It doesn’t show up at all on the PN-40SE GPS map, nor in Topo North America. And several roads do show up that aren’t actually there. In fairness, I’ll say I’ve discovered some roads I didn’t know were there by poking around on the motorcycle while using the GPS in real time. Net? If there’s any way I can help clean up the maps of this area, I’d love to. My thinking is that the map should show public roads. It would be nice to eliminate the private roads so John Q. Public can use the maps for planning! 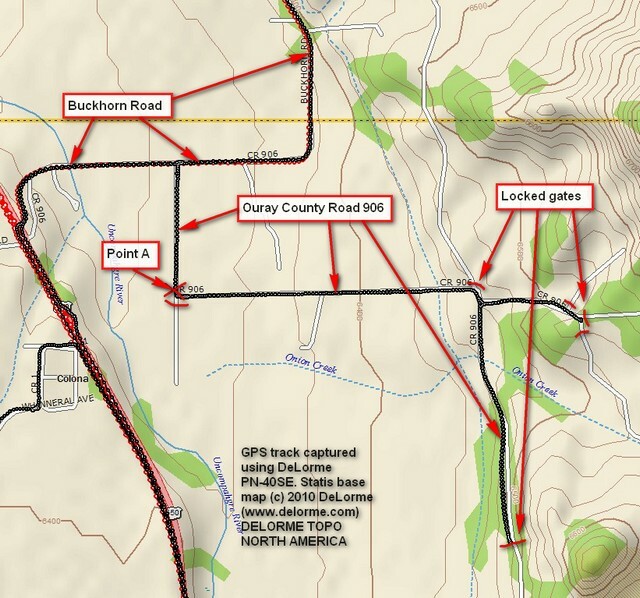 This entry was posted in GPS Tracks, Product Reviews and tagged Colorado, DeLorme PN-40SE, DeLorme Topo North America, making gps maps, ouray county. Bookmark the permalink. My experience is in Upper Michigan and Missouri, and I’ve come to suspect that they use a computer to analyze aerial photographs out in the sticks, and long, narrow stretches without trees become “roads”, or things that could be continuations of existing roads are also marked as such. The bad thing is that these are loaded into GPS systems for vehicle travel, and when you get city people–from places where the maps are pretty much dead on–relying on their magic boxes out in rural areas, they can end up in trouble. I’ve run into gates when trying to chase roads out here in Pulaski County, MO, like when I was trying to find the old Old Route 66 (before an alignment change bypassed Devil’s Elbow back in the 40’s). It’s surprising how good some of the old USGS 7.5 quadrangles hold up, even though some of them haven’t been updated since the early 80’s–I suppose that that fact also makes you more suspicious than the supposedly “new” Google Maps-enabled devices, and less likely to keep going even when looking out the window tells you something’s wrong.